Combination Classroom and On-Field Instruction. 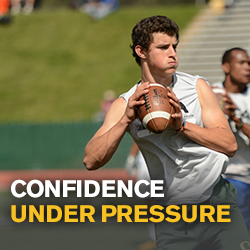 Classroom Clinics for improved Football Acumen and Powerful QB-Specific Teaching to complement dynamic on-field training sessions. 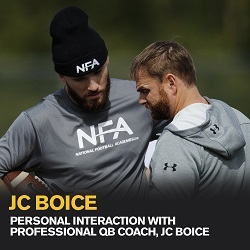 Detailed Analysis of QB Movements! 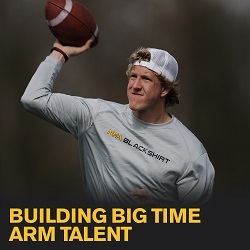 Quarterbacks have their throwing motion and movements scientifically analyzed and assessed, followed up with a regimen of QB drills to improve their throwing mechanics for maximized arm power and accuracy. Monday - June 10 1:00pm to 7:00pm Training. WHAT TO BRING: Football marked with your name. Athletic shorts and a T-shirt. Court Shoes and Turf/Grass Cleats. Water or Recovery Fluids. A PASSION TO IMPROVE! Bring a recovery snack/sack lunch. Athletes can eat during the classroom session.